UPDATE: SpaceX Falcon Heavy launched successfully Tuesday afternoon. Complete coverage here. SpaceX erected its new Falcon Heavy rocket atop historic pad 39A at the Kennedy Space Center Monday, setting the stage for its debut as the world's most powerful booster when it climbs away Tuesday atop nearly 5 million pounds of ground-shaking thrust. SpaceX founder and chief designer Elon Musk told reporters at the Kennedy Space Center that he's optimistic, adding "the weather's looking good, the rocket's looking good, so it should be an exciting day." "We finally have a major advancement in rocketry," he told CBS News during an earlier interview at the base of pad 39A. "I'm not sure whether this will be lost on people, whether they'll appreciate it. I hope they do, because the era of the very large rocket went away with Saturn 5 and with the space shuttle." "I find it odd that the Falcon Heavy is twice the thrust of anything from Russia, China, Boeing, Lockheed or Europe," Musk continued. "And I hope it encourages them to raise their sights." As for the rocket's maiden launch, by definition a relatively high-risk test flight, Musk said, "I'm looking forward to it. It's either going to be an exciting success or an exciting failure. One big boom! I'd say tune in, it's going to be worth your time." Carrying Musk's cherry red Tesla Roadster, complete with a space-suited "Starman" mannequin strapped in the driver's seat, the Falcon Heavy is scheduled for launch at 1:30 p.m. EST (GMT-5), the opening of a three-hour window. Forecasters predicted an 80 percent chance of good weather. The maiden flight of the Falcon Heavy has generated widespread public interest with tens of thousands of tourists and area residents expected to turn out along area roads and beaches to watch the booster race away, believed to be the biggest crowd for a space launch since the shuttle program came to an end in 2011. Musk has gone out of his way to downplay expectations, saying last year "there's a lot of risk associated with the Falcon Heavy, a real good chance that that vehicle does not make it to orbit." But on the eve of launch, he told CBS News he was optimistic and almost "giddy" with excitement. In the end, he said, SpaceX engineers have checked everything humanly possible to eliminate any unpleasant surprises. "We've done all the (computer) modeling we could think of," he said. "We've asked ... third parties to double check the calculations, make sure we haven't made any mistakes. So, we're not aware of any issues, nobody has been able to point out any fundamental issues. In theory it should work. But where theory and reality collide, reality wins." He put the odds of a successful flight at somewhere between 50 percent and 70 percent. Made up of three side-by-side Falcon 9 first stages and an upper stage carrying the Tesla, the Falcon Heavy will easily be the most powerful rocket in the world when it takes off, generating 4.7 million pounds of thrust with 27 Merlin engines firing in concert, nine per core stage. Later versions flying at full throttle will generate more than 5.1 million pounds of push, enabling the rocket to boost payloads weighing up to 140,660 pounds to low-Earth orbit or 37,000 pounds to Earth-escape velocities needed for missions to the moon, Mars or beyond. But the SLS is not expected to fly until late 2019 or later. 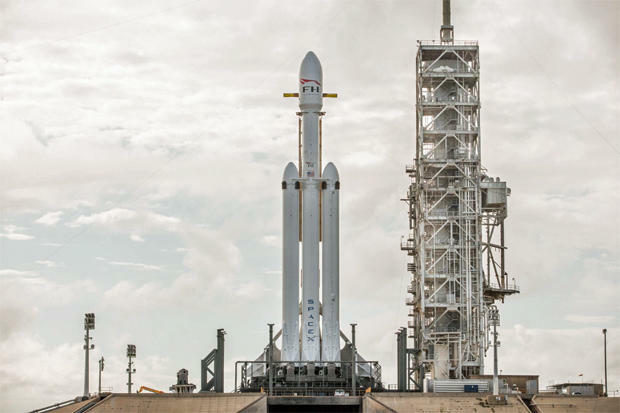 Until then, the Falcon Heavy, assuming it succeeds, will hold the record as the world's most powerful rocket, offering a relatively low-cost option for getting heavy payloads into space for NASA, the Department of Defense and commercial satellite operators. "I think this could be an extremely significant launch, first of all because it's happening in 2018, not whenever SLS is going to launch, it is going to be, if it succeeds, the most powerful rocket in the world, and that enables lots of different things," said John Logsdon, a noted space historian and space policy analyst. "It poses a competitive challenge to the NASA way of doing business. Just as SpaceX has posed a challenge to (competitor) United Launch Alliance that seems to be succeeding, it could well pose a challenge to NASA's launch strategy." If all goes well, the Tesla and its dummy passenger will be released onto a deep space trajectory about six hours after launch, breaking free of Earth's gravity at nearly 25,000 mph while David Bowie's "Space Oddity" plays in the background. Assuming it makes it through the high-radiation environment of Earth's Van Allen belts, and assuming the Falcon Heavy's second stage propellant doesn't freeze or boil away after six hours in the deep cold of space, the Tesla will be released on a trajectory carrying it slightly farther than the orbit of Mars. "We expect it'll get about 400 million kilometers away from Earth, maybe 250 to 270 million miles, and be doing 11 kilometers per second," Musk said. "It's going to be in a precessing elliptical orbit with one part of the ellipse being at Earth orbit and the other part being at Mars orbit. So it'll essentially be an Earth-Mars cycler. "We estimate it'll be in that orbit for several hundred million years, maybe in excess of a billion years," he said. "At times, it will come extremely close to Mars, and there's a tiny, tiny chance that it will hit Mars (someday). Extremely tiny. I wouldn't hold your breath." "It's just for fun," Musk laughed. "A lot of people (wondered,) what's the purpose of sending a car to Mars? There's no point, obviously! It's just for fun and to get the public excited. Normally, when a new rocket is tested, they put something really boring on like a block of concrete or a chunk of steel or something. ... The car is just the most fun thing we could think of." SpaceX typically attempts to recover its Falcon 9 boosters after launch. For the Falcon Heavy, the company will attempt to recover all three core stages after the Heavy climbs out of the lower atmosphere. The two previously flown outside boosters will separate, flip around and fly back to the Cape Canaveral Air Force Station for side-by-side rocket-powered descents to touchdown at SpaceX's Landing Zone 1. The central core stage will attempt to land on an off-shore droneship. The recovery of all three stages would push SpaceX's record to 24 successful landings in 27 attempts. Musk was particularly animated describing the landings and the dual sonic booms that will thunder across Florida's "Space Coast" as the two returning boosters slow down for landing. But it's the launch, seeing the most powerful rocket since the space shuttle climbing away from pad 39A, that has sparked such widespread interest. And no wonder. At liftoff, with all 27 core stage engines firing together, the Heavy will enjoy more than twice the liftoff power of a United Launch Alliance Delta 4 Heavy, the most powerful currently flying U.S. rocket, and more than one-and-a-half times the power of a European Ariane 5. For comparison, the Soviet Union's ill-fated N1 moon rocket holds the all-time record with a thrust of 10.5 million pounds, but it catastrophically failed in four launch attempts. NASA's successful Saturn 5, the gargantuan booster that propelled Apollo astronauts to the moon, generated 7.5 million pounds of push while the space shuttle rocketed away atop 6.8 million pounds of thrust. The Soviet Union's short-lived Energia booster generated 6.6 million pounds. Musk said the debut of the Falcon Heavy does not mark the rebirth of an Apollo-like program, "but it's arguably a prelude to a new Apollo, and it's going to be the only heavy- to super-heavy-lift rocket in the world." "This will be more than twice the thrust and capability of any other rocket currently flying," he said. "And if it reaches orbit, it will have the most payload of any rocket since the Saturn 5. You could actually send people back to the moon with the Falcon Heavy, you could, with orbital refueling, send people to Mars." Musk said last year that he planned to send two unidentified paying customers on a flight to loop around the moon, but he said today SpaceX is now focusing on building a new, even more powerful rocket known as the BFR, a huge machine he says can be used to help colonize Mars. It's not yet clear how the Falcon Heavy figures into that plan or whether enough customers, including NASA, might line up to buy the Heavy for commercial satellite-launching missions, to send interplanetary probes into deep space or possibly to send space tourists into space aboard a piloted version of SpaceX's Dragon spacecraft. "The Falcon Heavy is definitely capable of sending the crewed Dragon vehicle around the moon," Musk said. "We may still do that. It depends on how quickly the BFR development goes. If that development's looking good, then we will try to push everything to BFR. If that's looking like it's going to take longer than expected, then we'll send people around the moon using Falcon Heavy and Dragon." There are numerous "unknowns" when it comes to flying a powerful new rocket, even one utilizing multiple flight-proven stages like the Falcon Heavy. As the rocket climbs away, consuming propellant and losing weight, it will rapidly accelerate, subjecting it to hard-to-model aerodynamic and mechanical stresses as it plows out of the thick lower atmosphere. It is also difficult to model the vibration and acoustic environment at the base of the rocket where the 27 Merlin engines will be firing. The engines were test fired at the pad on Jan. 24 and SpaceX said later there were no problems. But, Musk warned Monday, "there's so much that can go wrong here." "There are a lot of experts out there saying there's no way you can do 27 engines, all at the same time, and not have something go wrong," he said. "You've got the booster-to-booster interaction, acoustics and vibration that haven't been seen from any man-made device in a long time." Even so, he told reporters later, "I'm really hopeful for this flight going as planned. We've done everything we could do to maximize the chances of success of this mission. I think once you've done everything you can think of and it still goes wrong, well, there's nothing you could have done. But I feel at peace with that."